Manchester United Transfer Speculation- Louis van Gaal is a big fan of Arturo Vidal since the player was in Bayern Leverkusen. He tried to sign him since he was Bayern Munich manager. After agreeing to lead Manchester United next season in the Premier League once again van Gaal showed his interest to this player. Arturo Vidal is currently play fro Italian Champions Juventus. Together with Paul Pogba, and Andrea Pirlo Vidal becoming key players of the club. Vidal is widely known for his tireless cover in midfield and he also could get in the box and score. Speculation arise the Chillean midfielder is opening his option to leave Juventus next season. A £40m innitial transfer believed is the price for Manchester United to obtain this player service. The club itself had try to persuade Juventus with £30m plus Luis Nani. Metro.co.uk reported this evening that Juventus had rejected Man United official offer for Arturo Vidal. The failure to get Vidal to Man United will make van Gaal frustrated because once again he cannot work with the player he is fond of. 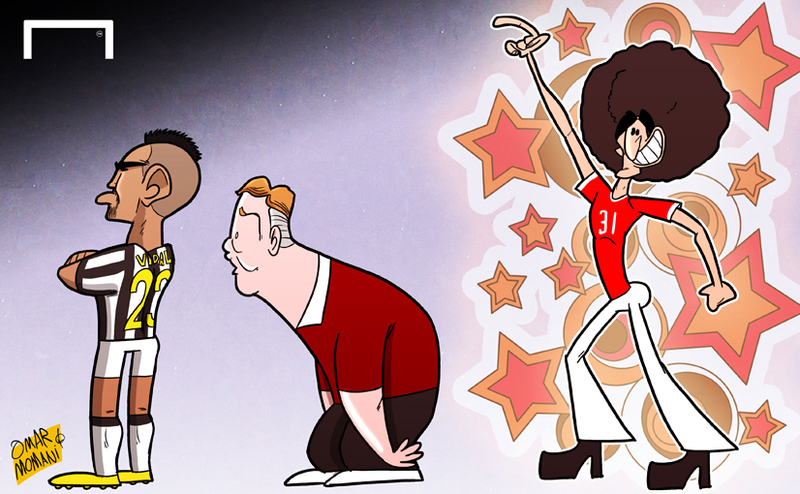 Fellaini: yeeaaa... (dancing afro) hahaha..